In America I have always had the feeling that one thing or one aspect you do not talk about at school is religion and your personal religious beliefs. I believe this stems from the thought that people’s feelings will be hurt, that it is too personal. I say “rubbish” to that way of thought, if there is one thing I have appreciated on this trip is the amount of religious discussions we have had in our group. Never had I had full on discussion about religions and my own personal religious beliefs with my own peers before this month. So, I would like to take the time so say Thank you Britain for allowing us to be a little bit more open in our beliefs. Throughout this month we have visited a number of Cathedrals, Churches, and Religious Centers. As a Catholic I definitely identified more with the Cathedrals and Churches we visited. My favorite of these was St. Paul’s Cathedral. It is a magnificent structure that really attests to the power and might of humans. 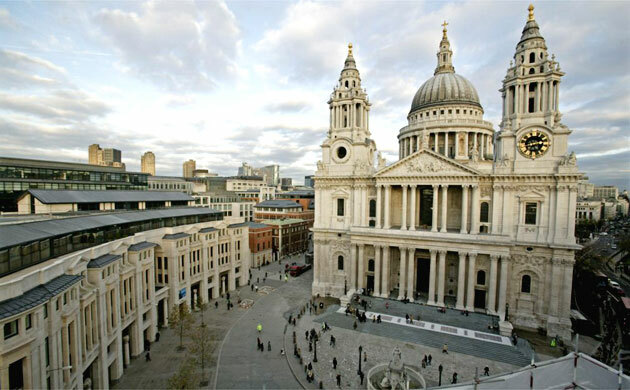 When I see gorgeous structures like St. Paul’s I always wonder how a great architects mind, like Christopher Wren, see when they see an empty space. People who are born with the ability to express through creation always impress me and make me just a little bit jealous. On other note I was really uneasy and uncomfortable with Britain transforming these Cathedrals and Churches from spiritual dwellings into semi- museums. I feel it makes them very impersonal and looses a little bit of its beauty. However, on the other hand it is also a way for people of different sects and beliefs to learn and experience these religions. I guess with every decision made there is a positive and a negative. After seeing all these really old places where kings and queens were crowned we moved on to religions that I know little to nothing about. The first of which was the Mandir. Let me just say that before this day I had never even seen what a Hindu place of worship looks like or known much about the religion. I was surprised to see another magnificent place of worship, with such high precision of architecture. The religion itself is radically different from what I am use to but nonetheless I felt welcomed and curious at the same time. Perhaps, what struck me the most was the fact that in the place of worship and veneration women and men are separated. After the Mandir we visited a Mosque in the East End. 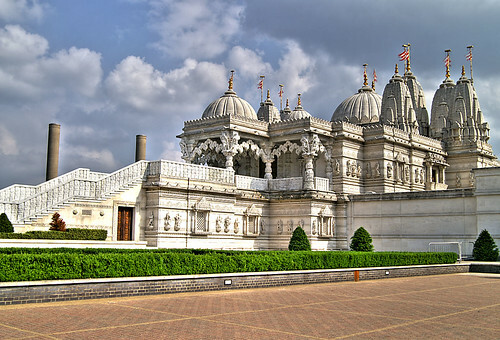 Unlike my learning experience within the Mandir I felt my opportunity to learn about Islam and the community was lost in such a quick and impersonal tour. The Mosque was pretty well developed but the interior was not as interesting as I had expected it to be. I was actually excited to wear a head covering to visit this temple just because I had never been required to do it. The last place of worship we visited was a Synagogue. This was not my first visit to a Jewish temple but it was very different to my last experience. In my last experience I attended an actual service and I had to go through security check prior to entering the premises. In the actual services I felt like a complete outsider I hardly knew what was going on. This time, however, we were expected. We did not have to go through security and were given a very comprehensive lesson on the history of Jewish people in England. All around it was a great experience. From all my visits to these largely different and sometimes similar sects of religions I came to my own conclusion about religions in general. Religions will always be necessary as long as man live. Religions were at first the first form of government for communities stipulating how to act, how to work, how to live as a unit, etc. Now religions provide for man a sense of purpose beyond our own physical existence, they attempt to explain the unexplained, to give hope, to give a sense of identity, and lastly to create a sense of community. Therefore, I think that all religions will continue to existence as long as man lives. I am not entirely sure that religions were the first form of government for mankind. How do you think the increase in physical understanding of the universe has shaped our (as in, the world’s) relationship with religion? I find your last paragraph especially interesting. well in my opinion the greater knowledge of the universe we have today has done one of two things to our relationship with religion. It has either cemented humans own insignificance in the world/ universe further supporting the belief in a greater being. Or it has made people believe there is absolutely no way one being could have created and kept track of everything that exists in the universe. Why do you find my last paragraph interesting? How do you think our increase in knowledge has affected our relationship with religions?